GREEN SCENE is a super-concentrated, green spray dye designed to be used with all pesticides, herbicides and liquid fertilizers. 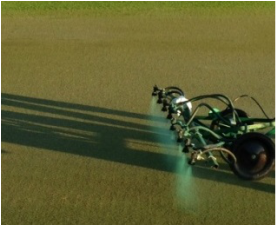 GREEN SCENE will help prevent overlapping and skipping of valuable chemicals and fertilizers on all turf grasses. Mix 4-6 ozs. of GREEN SCENE per 100 gallons of water. Refer to SDS for complete safety information prior to using this or any other chemical product.